What is a hashtag and why should you use it? A hashtag (symbol: #) is a way for social platforms such as Instagram to organize content and distribute it to right the people. You can either use hashtags to discover content or to contribute to an already existing conversation. In this sense, hashtags can serve a variety of purposes if you use them well. And by using them well, we mean adding value to the conversation. This can’t be stressed enough. The north star of your social media approach should always be to deliver more value than you take. This is the only way that you’re going to create a loyal engaging community. How do you find the best hashtags? There is no secret formula for this. You have to become a practitioner and spend time researching/testing. Some people like to use apps that claim to gather the most popular hashtags. We personally like to use the IG app to discover which hashtags are more relevant to our posts. Keep in mind that the more popular a hashtag is, the harder it is to rank in it. When you’re first starting off, it’s better to go for tags that are specific to your niche. Doing so will give you a better chance of becoming relevant in that tag and hitting the explore feed. You can use a maximum of 30 tags, but we recommend that you refrain from using too many. Based on our data at the agency, you can use up to 9 tags before seeing a dip in engagement. We recommend starting with one or two and adding more as you go in order to measure which hashtags bring you the most impressions/reach. You can tap into the insights that are available in the Instagram app if you have a business account. Setting up a business account is a piece of cake. Just create a Facebook page and link it to your IG account. Too often do we see people using popular hashtags just to get more likes. Don’t fall into vanity metrics. It does no good for your account. Don’t sacrifice long term upside for short term likes. You’re better off using tags that are relevant to your niche to cultivate meaningful conversations. Most generic tags are targeted by automated accounts that use third-party apps to like, comment, follow/unfollow. You don’t want to add tags like #follow, #followme, #likeforlike because you'll get low quality engagement. The goal is and will always be to interact with real people in order to create strong communities. Now that we’ve defined what hashtags are, what purpose they serve and how to find the best ones, let’s dive into the different types of #. The easiest way to categorize your content is to use a hashtag unique to your brand. People will be able to find your content by searching for that specific hashtag. When you’re first starting off the hashtag won’t bring you that much traffic since nobody actually knows about it. But in the long run having your posts tagged accordingly will help people discover your content. Regardless of your industry, your business probably offers a range of products and/or services. Hashtags relevant to a particular product can help narrow the search and give customers easier access to specific information that they may be looking for. Think of this approach as a way to sub-categorize a post. Brands can use both branded and product hashtags in a single post. You can think of this one as an extension of the branded hashtag. Community tags serve as gateways to engage with your audience and get them to talk about your brand on social media. For example, Nike has its original branded hashtag #nike but the community uses #mynikes to showcase how they rock their sneakers. Getting your audience to participate in user-generated content can help strengthen the brand and increase loyalty over time. Using this type of tag can help create a sense of camaraderie around the brand and potentially facilitate the interactions between like-minded community members. Ideally, as the brand, you should also engage in the community hashtag to show appreciation and contribute to the conversation. Whether you’re doing a traditional marketing campaign or a quick giveaway, hashtags can be extremely helpful when it comes to tracking community engagement and campaign entry. Campaign tags have a start and end date. Making one can be as simple as your brand hashtag + giveaway. From that point, it’s easy for you and your marketing team to stay on top of social conversations and pick a winner. In case of special events such as conferences, the organizers can prompt attendees to post about the gathering. This helps create conversations around the event and give the brand an opportunity to engage in questions that participants may have. It’s an efficient way to build connection and spread brand awareness. A great way to gain exposure for your brand is to jump on a trending hashtag. Be careful with this as it can backfire if you are not prepared to deal with the conversations that might unfold. Make sure that your brand is actually a good fit for the hashtag. Anything related to holidays such as #newyear, #halloween can be an opportunity for your brand to express a different side of your culture. As always, make sure that the context is relevant to your audience. Don’t just jump onto the bandwagon if your brand doesn’t actually seem like it would celebrate the holiday. Using culturally relevant hashtags can help your brand gain more exposure in search results. All in all, we’ve talked about using hashtags from a standpoint of bringing exposure to your content. Don’t forget however that hashtags are not just for people to discover you. You can and should use them to tap into an existing community. Social media isn’t just about talking. It’s also about listening. Make sure you don’t neglect the importance of jumping into conversations that are already happening. One of the best ways to grow your audience is to participate in an already existing community. Ever wondered how to have a professional looking email signature with social links? Today we're showing you how to do this in 5 minutes! Simply signing your name and position in the company at the bottom of your emails is totally acceptable, but think about how many more opportunities you could get just by adding a link to your Instagram profile or your Twitter page. Not only do you get more traffic, but your clients get a better sense of who you are as an individual which will ultimately build more trust over time. Why not take advantage of technology and optimize your email to drive traffic to your social channels. It’s all upside. It’s a little tweak that can potentially make a big difference. Here is the link to our YouTube video explaning the whole process. The reason for this change is simple. Facebook wants users to spend more time on the platform by giving them a more pleasant experience. Businesses now have to be more creative and spend more ad dollars to get in front of a prospect’s eyeballs. Is it time to say goodbye to organic reach? Is Facebook now pay-to-play like television/billboards/radio and print? There’s no denying that organic reach has decreased over the last 2 months. But that doesn’t mean it’s gone. At the agency, we’ve managed to get content in front of target audiences and keep our engagement rates up by using these 5 simple tips. 1. 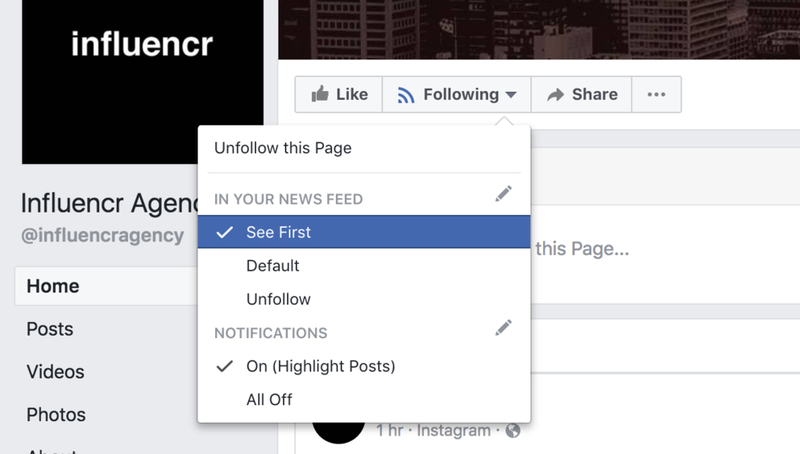 Encourage your audience to select the “See First” option in their News Feed preferences. This is one of the easiest “asks” you can do right now. If you’re truly providing value to your followers, getting them to take this action shouldn’t be an issue. See picture below for an example of what we did with our agency Page. 2. Post content that spark conversations. The main reason why businesses are seeing a decrease in reach is because they tend to create push content aimed at getting quick short-term sales. You want to design content that provides value and prompts the community to participate. Great ways to do this include: asking for their opinion, teaching them something, posting something funny or motivational, posting content that is culturally relevant. 3. Avoid engagement “bait” techniques. Scrap any wording that literally tells people to comment, like, share or tag a friend. 4. Leverage attention on all social platforms. When it comes to social media, it’s rarely a good idea to put all your eggs in one basket. Make sure you’re cross-promoting to grow your audience on all social platforms as well as your email list. This will give you more control over your reach without being at the mercy of Facebook’s algorithm. Let’s be real. Facebook’s ad platform is still incredibly underpriced for what it does. Hyper-Targeting and custom audiences done properly allow you to optimize your ad dollars and reach individuals that actually resonate with your product. Facebook changes have happened before and they will continue to happen as the platform evolves. The only constant is change. As marketers and business owners, we have to stay on the cutting edge to find out the best ways to communicate our message. On that note, there’s no reason to fear an algorithm change if your ethos is to give more value than you take. Good content is and will always be the foundation of your social media success. With the internet becoming increasingly noisy, how do you create great content that stands out and grabs people’s attention? When it comes to communication, it’s not only about the content that you share, but also the medium that you’re using to convey your message. While written words and pictures are great ways to communicate, some things are often left out due to the limitation of the medium. There’s this popular saying that a picture is worth a thousand words. If that’s the case, how many words is a video worth? For spoiler alert: check image below! On this infographic, given that we follow the conventional saying, a 60 sec video at 30 frames/second is worth 1.8 million words. Imagine how much more information is added via video format. No wonder this medium is becoming ever more popular with consumers and marketers. In fact, according to Cisco Forecast, video will represent 80% of all consumer-based Internet traffic by 2019. If you’ve been paying attention to social networks like Facebook or LinkedIn, you’ve probably noticed how they’ve invested heavily in their video capabilities in the last few years. Facebook recently rolled out it’s “Watch” feature which is essentially focused on episodic type of content. LinkedIn is pushing native video uploads on their platform by giving them more organic reach. And YouTube, which is a search engine in its own respect, has over 300 hours of video uploaded to it’s platform every minute. The rise of video consumption is clear, but does this mean that you should add this medium to your marketing strategy? Is it worth the investment? Here are 3 reasons why you should invest in video. 1. Video can deliver information in a concise and entertaining way. The world is moving faster and faster. Time has now become our number one asset. The fact that people can watch a video of you explaining what your product is about instead of reading about it is ROI positive for them. Obviously some complex product will require more written specifications than other but as a general guideline, videos help convey what is often left out with simple pictures or words. Instead of cluttering your landing page with extensive writing or adding a long description with a picture, sometimes using video format makes the whole process much more enjoyable for the consumer. People generally prefer watching over reading. Watching something requires less effort on the consumer’s side of things. According to a research complied by 3M, close to 90 percent of the information our brains pick up is visual, and we process visuals 60,000 times faster than we can process text. You’re much more likely to watch a 30 second video than read a 2,000 words description about a product. Over 500 million (that’s half a BILLION) people are watching video on Facebook every day. With these staggering stats, you can see why it’s a good idea to take advantage of this traffic. Video content opens up all kinds of possibilities to reach a wider audience. In fact, social platforms such as Facebook, Instagram and LinkedIn prioritize video format by giving it more organic reach. Another factor to account for is the higher engagement and sharability of video. It's estimated that 92% of people who consume mobile videos share them with other people. This is a massive portion and is higher than the share rate of many other types of content out there. Let’s keep it simple. For conversion to actually happen, you have to get the consumer’s attention first. It doesn’t matter how good your product or cause is if no one knows about it. The core reason why video is better for conversion is because you can grab a person's attention fast. As mentioned in the first point, we process visuals a lot faster than we process text. And in a world where information is coming from all angles, it’s a good thing to be able to get someone’s attention as fast as possible. Video marketing taps into more senses: visual and auditory, which means it’s easier to remember than text-based content only. Studies have shown that adding video can improve one’s ability to remember concepts and details — with effects that even increase over time. Viewers retain 95% of a message when they watch it on video, compared to 10% when reading it in a text. Using this medium to deliver a message will make it easier for customers to remember your content. This will help strengthen your brand, which will translates into more sales and leads for you. Another important point to consider with conversion is rapport. We’ve evolved for thousands of years communicating face-to-face. That’s always been our primary way of determining if someone is genuine. Using video, you can essentially replicate this at scale. As the popular saying goes, we’re more likely to buy from people we trust. The increase in click-through rate with video is as high as 96% and 64% of customers are more likely to buy a product online after watching a video about it. Far from it. They all have their place and time. It’s not so much about which way is right or wrong. It’s about attention. Where is the consumer spending most of their time and what actually gets their attention? Whether you're trying to sell something, build awareness, get someone to take action, or teach something, video could potentially be the vehicle for you to drive your message. But remember, the medium is still just the vehicle. Don’t let it steer you away from the thing that matters most: the message. With everything moving so fast, it seems that something working today could be obsolete tomorrow. That being said, there are some general guidelines in terms of Do's and Don'ts on social media. Here is a list of common mistakes that people and businesses make on social media. Let’s get one thing straight, automation is ROI negative for your social accounts. This strategy used to work 2 or 3 years ago, but using it now will only damage your account’s ranking in the algorithm. Instagram and Facebook’s systems have enough data and are smart enough to detect human vs. automated behaviour. The whole purpose of automation was to grow your account using tactics that worked manually. We used to follow/unfollow, like and comment on every post because it brought exposure and helped us grow. This is not the case anymore. As of right now, it’s not about the quantity of interactions that you have, it’s about the quality. The days of growing your account by leaving 20 comments in an hour, liking 200 posts as well as following/unfollowing the maximum amount of people are long gone. This ties back to number 1. Understand that social platforms reward social behaviour. Making sure to spend that extra 30 minutes a day to comment meaningful things on people’s post and being a part of the community is the best way to build your brand online. Going that extra mile is often what distinguishes you from all the other accounts as it builds credibility and trust. Hashtags are pretty much useless for growth. Yup, I said it. With the social platforms crowded with automated accounts, using hashtags will only attract automated likes and bot followers who will unfollow you 2 to 3 days later. Instead of using hashtags, try to find engagement groups that are specific to your niche. Having them engage with your content and you engaging on theirs will help the algorithm categorize you in that particular niche. You’ll be much more likely to hit the Explore feed and gain exposure. Another alternative to growing your page is using Instagram’s paid ads or buying shoutouts from bigger pages. When buying shouts, make sure that the seller’s audience is compatible with yours and check the quality of their engagement. In order to grow your audience and bring value to them, you need to open your eyes and adapt to the feedback that is given by raw data. I see too many people stuck at the same spot for months on end because they keep doing the same thing over and over again. Look at what the best pages in your niche are doing and get inspired from them. Analyse the style of their pictures or videos, look at how they edit their videos and how they format their captions. See which posts perform best and go in that direction. Little by little, you’ll get a better sense of what the market truly wants and you’ll develop a communication style that is unique to you. Social media is a means to something bigger. It’s a tool. Whether you’re a business or a personal brand, your KPI (Key performance indicator) should be clear and precise. I’m fairly confident to say that the ultimate goal of any business is to sell. That being said, let’s look at what’s better: having 1,000 followers and having 50 of them buy your product or having 10,000 followers and only having 30 of them buy? The fact that people are stuck on follower count is unfortunate. The truth is, your quantity of followers don’t matter as much as the quality of those followers. The audience that you’re collecting should be an audience that is readily open to the content that you’re pushing. You build this kind of following by actually engaging with them and providing them with value. Don’t lose sight of what’s actually important here. This ties back to number 5. No matter the size of your audience, you should be grateful for the people that follow you. Make sure you engage with them and bring them value on a continual basis. The best way to lose followers is to take them for granted. You want to build a relationship of trust and loyalty and that has to go both ways. They have to see the disproportionate value that your are bringing them as a brand and they need to feel a part of your tribe. A good book on this is “Tribes” by Seth Godin. As Gary Vaynerchuk talked about in his book “Jab, Jab, Jab, Right Hook”, you need to be aware of how much you’re giving vs. how much you’re asking for in return. In a social media context, a jab is simply a post that gives value to your audience. On the flip side, a right hook is a “straight ask”. So many businesses are not getting the ROI that they want from social media because they treat it as a one way communication channel where they’re constantly going for the sell. Make sure you balance it out by actually providing value. Making it all about you will only drive your followers (i.e. potential customers) away. Bring your audience as value as much as possible and from time to time sprinkle in that right hook. They’ll be much more receptive to this approach and your conversion rates will be much higher. The balance of giving value vs asking for something is key in order to maintain healthy, trusting relationships with your audience. We hope you enjoyed this post! Let us know your comments and feel free to share this with friends and family! For the first episode, I talk about the misconceptions that business owners often have about social media. I'll discuss the differences between marketing on social media vs. the early 2000's approach to SEM. I give my thoughts on what marketing means to me (branding + selling) and why most people are stuck in the selling aspect of it.